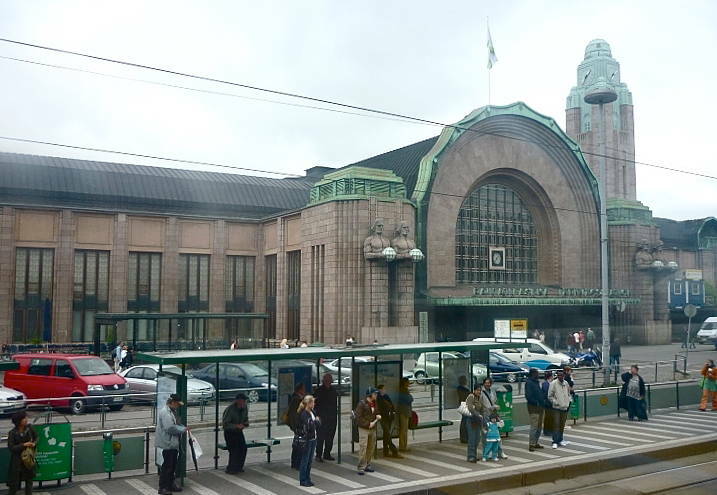 According to Brian Solomon, this is "one of the world's great railway terminal buildings, and one of only a few that embody an art nouveau aesthetic" (others in this category include Adolphe Dervaux's Gare de Rouen-Rive-Droite, Rouen, 1928). Solomon continues by explaining that Saarinen was inspired by the Vienna Secession movement, and "designed using a blend of elements of the Arts & Crafts movement with themes from traditional Finnish rural architecture to produce decidedly romantic and nationalistic styles." But although Art Nouveau elements are obvious here, especially in the massive stylised statues with their lamps, this describes Saarinen's early style better than the station itself. The "great portal archway" and "enormous granite clock tower near the eastern entrance" to which Solomon later draws attention are neither "rural" nor "decidedly romantic" (217). They make bold forward-looking statements and are an early expression of Saarinen's later beliefs in, respectively, the idea of an "embracing space" (Saarinen 121), and balance or equilibrium: "If the building is lacking in balance, it is lacking in that most essential property which might make it beautiful" (Saarinen 286). In fact, Saarinen's first design had been "romantic" (see Sarje, fig. 2, p. 97); but he had changed it radically in response to controversy about it. For more details see C. H. Townsend and the Finnish Connection. These changes were to be critical not only for Saarinen's own highly influential career in America, but also for the future of modern Finnish architecture, as exemplified later in works by the equally influential Alvar Aalto (1898-1976). "Eliel Saarinen, Architect Biography." Web. 4 April 2011. Saarinen, Eliel. The Search for Form in Art and Architecture. Mineola, NY: Dover, 1986. Sarje, Kimmo. Gustaf Strengell and Nordic Modernism." The Nordic Journal of Aesthetics, No. 35 (2008): 93-120. Web. 4 April 2011. Solomon, Brian. Railway Masterpieces. Newton Abbot: David & Charles, 2003.